I am so sorry for your unimaginable loss. Hearing of the terrorist act by a hate-filled gunman at Pulse in Orlando was a punch in the gut. The senseless loss and disregard of the value of life screams through the headlines. 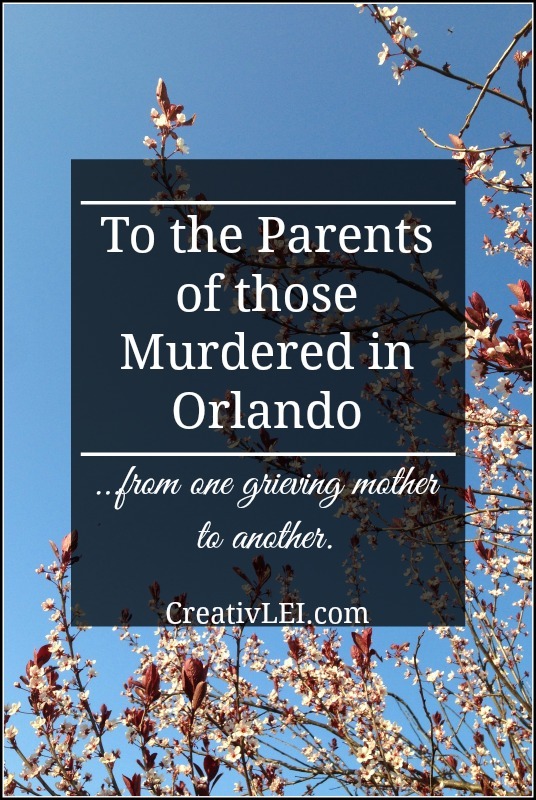 As a loss-mom, my first thoughts go to the parents of the men and women who were murdered yesterday morning. You’ve woken up in the very worst of horrific nightmares. I started praying over the many facets of your loss. No parent is ever ready to bury their child. No death is easy to bear. When your child has lost their young life because of fear and hate, there truly are NO WORDS that are sufficient. I am so sorry that the rest of the country (world) wants to politicize your loss while you are trying to re-learn how to breathe! I want you to know that I see your tears, I hear the crack in your voice as you wonder if it safe to openly grieve. I know that these days, as you are planning your child’s funeral, are not the time for the world to thrust their expectations on your shoulders as one more thing to bear. I’ve seen the lists of your children’s names and ages and I am shaken by the youth and promise of potential that was lost. I am so sorry that you will not look into the eyes of your child again on this earth. I cannot help but wonder how many of you had just recently come to a place of reconciliation and acceptance of your child’s lifestyle (and recovering from the grief of shedding cultural expectations) only to have the coming years of healing stolen from you, by hate and fear. I would be remiss to ignore the fact that some of you may have had this devastating phone call or headline be the moment when you were allowed into the place of your child’s life that they had not yet summoned up the strength to share with you. Perhaps they were protecting themselves, or maybe they were protecting your heart or reputation. I am sorry that our society told them that who they were was not enough. I am so sorry that you did not have the chance to embrace, love, and accept your son or daughter exactly the way they were without condition. I know that there is much that was ruthlessly ripped from you that can never be returned. 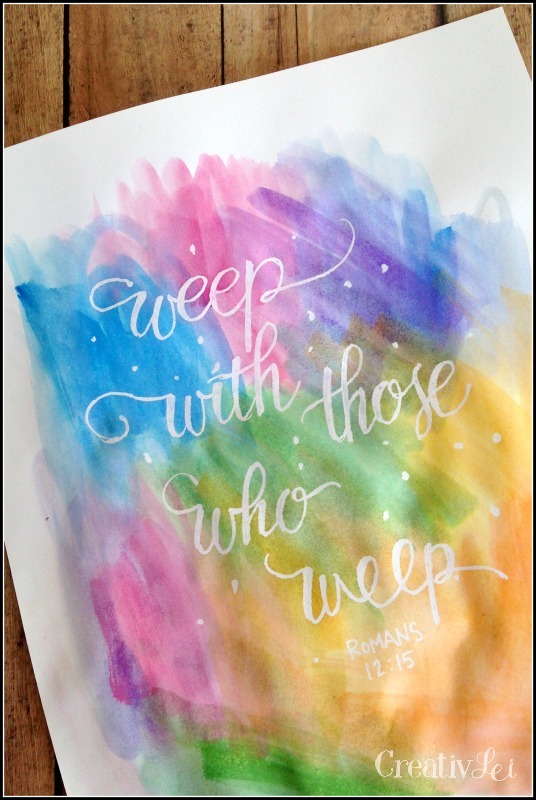 I weep with you as you mourn. I cannot hide that I believe in the hope of salvation through Christ. I believe He died for our sins, to reconcile us to God. I believe that the hope of salvation was extended to your child. Christ extended forgiveness to the thief on the cross… the promise of Eternity in the last moments before death. Who am I to assume what He can or cannot accomplish in anyone else’s final moments? I am sorry that the church that cast out your child, shamed your parenting, and held boycotts over bathrooms, now wants you to fight along side them against the greater evil. You owe no allegiance, you are bearing a burden they can and will not fathom. All I can say is that I am sorry. Take your time to grieve. Allow it to be ugly. Allow it to be all shades of messy. Remember your child. Remember all the good. Try your best to forget the bad conversations, the slammed doors, the unanswered questions. Know that you were and ARE a good parent. Know that the love you have for your child does not need to be justified. I acknowledge that I do not know what it is like to walk in your shoes. I cannot begin to unwrap the many emotions you are struggling through. I fully understand that every loss is different and I do not dare to compare our losses. What we do share is the label of grieving mother, and with that hand and broken heart, I reach out through prayer and compassionate thoughts. I know that the coming months and years may bring regrets to the forefront of your mind, I still battle these false beliefs. Cling to the hope, the good, the peeks of joy that come through the unexpected consolations. Celebrate your child’s legacy, because what others mean for evil, God can and will redeem! My prayers are with you, newly bereft mothers. I am so sorry that you are now part of this unspeakable sorority. Beautifully heart and Holy Spirit inspired. There is a promise, let not my words go forth without accomplishing that which it was sent. Your heart shown in this, many Blessings.